One of the nicest things the NICU attending did for us was to send us home with a form filled out for a temporary handicapped parking placard. I guess when you have an oxygen tank in the car, this makes you eligible. I didn't have time to go to the DMV, so I sent the form in the mail. That was my first mistake. More than a month later, after countless appointments where a handicapped parking space with the baby and the oxygen tank might have been nice, I still hadn't received my handicapped placard in the mail. I called and they said I could come in person to get it done, since they were backlogged. So today I went to the DMV Medical Affairs Office in Quincy. I waited an hour for a lady to come and hand me an envelope and tell me that I was approved, but I needed to take my baby to the DMV to have her photo taken. So I guess my second mistake was not asking if I had to bring my baby. Because she might drive the car, and she should have her photo taken too. Ok, I am being facetious. I see how people could abuse their privileges, but it really seems like such a hassle. I asked if I could bring in a picture, and apparently that could be allowed if I write a letter explaining why I couldn't bring Evie in person. Having already had a taste of the DMV bureaucracy, I think I will just avoid all possible problems the 2nd time around, and just take her back to Quincy to have her picture taken. Maybe we can hold her oxygen tank up so it can be in the picture too. Because really it's like my 2nd child when we're out and about! 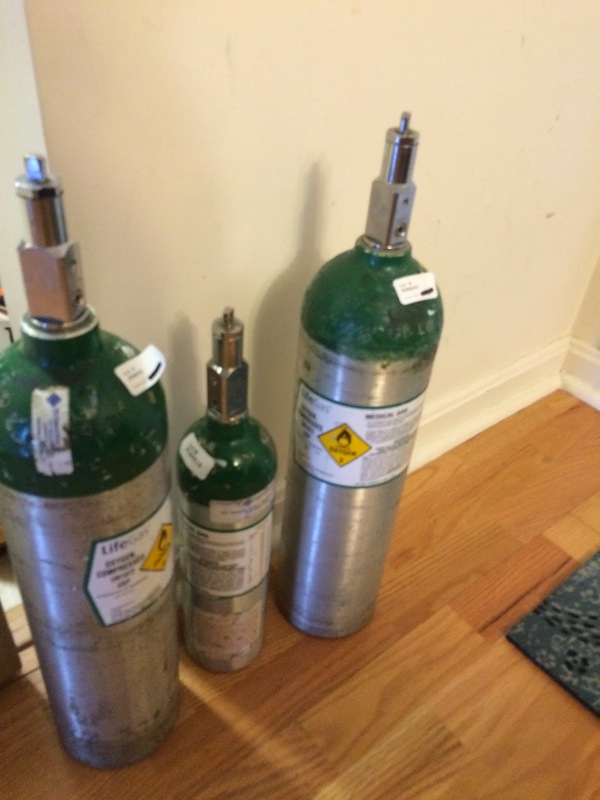 Oxygen tanks--the big one lasts about 2-3 days, and the little one lasts 2-3 hours.